Featuring everything you need to give your skin the best care possible, the DELAROM range at Beauty Expert includes revitalising anti-ageing creams, lifting serums and smoothing scrubs to leave your skin looking energised and more youthful. Infused with organic botanicals and advanced patented biotechnology, DELAROM’s eco-friendly products provide excellent anti-ageing results thanks to their focus on using Mediterranean ingredients and valuable essential oils which are renowned for their calming, regenerative, antioxidant and moisturising properties. DELAROM also incorporate aromatherapy into their products, and use calming, balancing and stress-relieving scents, such as sweet orange, orange mint and petitgrain to give you an optimum sense of wellbeing. Specially formulated to naturally care for your skin, DELAROM’s products are made using 30 years of French expertise, experience and passion. Dedicated to cleansing, nourishing and protecting your skin from head to toe, DELAROM’s products will allow you to re-create a spa experience in the comfort of your own home. Which DELAROM products are good for ageing skin? 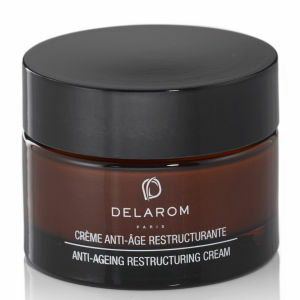 DELAROM Anti-Ageing Restructuring Cream 50ml: Specially formulated to smooth fine lines and strengthen the epidermis, this nourishing cream is enriched with argan oil, rose hip oil and olive extract to intensively hydrate your skin whilst fighting the signs of ageing. DELAROM Anti-Ageing Balancing Aroma 15ml: This potent concentrate is formulated with 100% pure and natural essential oils which help to reduce the appearance of wrinkles and fine lines, whilst enhancing your skin’s natural radiance. Designed to fend off free radicals, the concentrate will ensure your complexion is protected from harsh environmental aggressors. DELAROM Face Lifting Serum 30ml: Producing an immediate tightening effect, this anti-ageing serum is highly concentrated in active ingredients to improve elasticity and limit trans-epidermal moisture loss. Illuminating your complexion with a youthful glow, the nourishing serum will smooth and lift your skin to create a younger-looking appearance. What is the DELAROM Acquaconfort Mask? The DELAROM Acquaconfort Mask is an intensively nourishing treatment which improves levels of hydration and strengthens the skin’s barrier. Designed to give your skin increased suppleness and vitality, the mask will fortify your skin’s hydrolipidic barrier to banish any areas of dryness and discomfort. Suitable for normal to dry skin, it makes a great weekly treat for your complexion. Does DELAROM do a cleanser that’s gentle enough for my sensitive skin? They DELAROM’s Cleansing Water is mild enough for all skin types, including sensitive complexions. Specially formulated to maintain the natural balance of any skin type, the cleanser will not only remove makeup and impurities, but will also help to regulate sebum production for a matte finish. Enriched with peony flowers, the cleanser will leave your complexion feeling thoroughly refreshed.